The application of blockchain has now shifted to various areas such as payments, exchanges, smart contracts, digital identity, documentation, clearing, and settlement. Some of the major factors driving the growth of the blockchain technology market are transparency and immutability, faster transactions, and reduced total cost of ownership. The blockchain technology also offers other key benefits such as trustless exchange, durability and reliability, and empowers the users to control all their information and transactions. In coming years the key opportunity areas for blockchain technology would be disruption in technology across various industries; high adoption of blockchain technology for payments, smart contracts and digital identities; and evolution of a new breed of programmable blockchain technology platforms. Blockchain is a distributed ledger technology that records the cryptocurrency transaction data into blocks. Each time a block gets completed, a new block is generated; the blocks are linked to each other in proper linear, chronological order like a chain, with every block containing a hash of the previous block. Each block containing the data is cryptographically hashed, using complex mathematical algorithms. In 2008, cryptocurrency was used by gamers and traders for gambling purposes. The blockchain concept gained popularity in 2009 and was implemented into the source code for bitcoin, with the goal of overcoming the shortcomings of physical commodities such as currency. This created a global means of value exchange that was reliable as well as secure, and was used by different intermediaries to conduct and settle transactions. As the distributed ledger technology gained momentum, various use cases of the blockchain technology were explored. In 2016, the blockchain technology went mainstream. Key innovators in the blockchain technology market include IBM Corporation, Microsoft Corporation, Deloitte, Ripple, Chain, Abra, BitFury, Coinbase, Circle, Digital Asset Holdings, Blockchain Tech Ltd., Global Arena Holding, Inc. (GAHI), Digital CC Ltd., 21, Inc., and Earthport. These players adopted various strategies such as venture capital funding, new product developments, mergers, partnerships, collaborations, and business expansions to cater to the needs of the global blockchain technology market. An Automated Guided Vehicle (AGV) is a vehicle that consists of one or more computer controlled wheel based load carriers that run on the plant floor without the need for an on board operator or driver. AGVs are bringing about a disruptive change in the material handling industry market due to their high flexibility, cost effectiveness and efficiency over human counterparts. Since their inception in 1953, the global AGV market has grown steadily over the years and was at $1.53 billion in 2014 (including software, systems engineering and peripherals). This report is deep-dive into the Global AGV hardware market and comprehensively showcases data in the form of unique info-graphic elements. The global AGV market has been segmented on the basis of Guidance systems used, AGV product type, supply-chain segments, applications, payload capacities and a detailed geographical segmentation with a country-wise fourth level sub-segmentation. Other key features of the report include a detailed competitor intelligence, key opportunities, analysis of the robotics value chain and an Analyst Impact Center (AIC) section which provides answers to key strategical questions focused on stakeholders in the market. Bastian Solutions, KUKA, Swisslog, JBT Corporation, Amazon robotics, Grey Orange, Dematic, Egemin Automation Seegrid Corporation, Savant Automation, Bosch Rexroth, Daifuku Co. Ltd.
WARREN, NEW JERSEY, UNITED STATES, March 29, 2018 /EINPresswire.com/ — When a loved one is first diagnosed with dementia or Alzheimer's disease, it's easy to get overwhelmed. You probably have a lot of questions. You may wonder how you can keep your loved one safe as their cognitive decline progresses. Whether they're living with you or in their own home, Alzheimer's and dementia patients have some unique safety needs. "Fortunately," says Stephanie Howe, owner of Comfort Keepers of Warren, NJ, "there are many things you can do to help your loved one stay safe at home." "We know our clients want to feel safe in their own home," adds Howe. "And much like young parents have to take steps to adjust the living space for the safety of their children, we have a process to help make homes safe for dementia and Alzheimer's patients." "We call it elder-proofing," says Howe. Comfort Keepers Warren, the leading in-home care provider of central New Jersey, has assembled a quick checklist of the top things people can do to help make a home safe when caring for someone with dementia or Alzheimer's. Dementia is a progressive brain disease. Alzheimer's is the most common type of dementia. The World Health Organization estimates that around 50 million people have Alzheimer's or dementia worldwide. Dementia and Alzheimer's are commonly diagnosed in adults in their mid-60s or older. Symptoms of the disease include memory loss, impaired judgment, personality changes, problems learning new things, confusion, and wandering. In order to keep your loved one safe, you'll need to make some changes to their home to deal with these symptoms. According to the journal Age and Aging, people with Alzheimer's are three times more likely to fracture a hip than those with no form of dementia. One reason for this finding is that dementia can cause problems with balance, perception, and memory of furniture locations. Look around your loved one's home for obstacles they could potentially trip over. Remove unnecessary furniture and keep living areas free of clutter. Slippery surfaces, such as bathroom tile, can be the source of falls. Install nonskid strips or mats over tiles. Make sure stairways have railings. If your loved one is unable to maneuver stairs on their own, you may want to place a gate in front of the stairs. Use a home security system that informs you if doors or windows have been opened. Keep a regular daily routine. If you need to separate from your loved one, leave them in the company of a caregiver. Comfort Keepers of Warren, New Jersey, can help keep your loved one safe when you're not at home and give you peace of mind while you're away. Give your loved one a medical ID bracelet with their name, phone number, and address. If your senior loved one does wander, call 911 if you can't find them after 15 minutes of searching. Cleaning products, weapons, tools, and medication are just a few of the items you should keep away from your loved one with dementia. If possible, remove these items from the home. For items that can't be removed, use child-proof cabinet locks. Consider keeping a lock on garage or basement doors, where potentially dangerous items may be stored. Adequate lighting can help your loved one be safer in the home. Examine lighting throughout the house, replacing light bulbs where needed. If necessary, add lamps to dark corners, making sure cords are kept out of the way. Keeping nightlights on in bathrooms and bedrooms can help reduce your loved one's confusion when he or she wakes during the night. A personal emergency response system is a communication device that your loved one wears as a necklace or bracelet. If an emergency situation occurs, such as your loved one falling or becoming lost, he or she can press a button, and help is on the way. This type of communication device works best for those in the early stages of Alzheimer's disease or dementia. WARREN, NEW JERSEY, UNITED STATES, March 29, 2018 /EINPresswire.com/ — Stephanie Howe, owner of Comfort Keepers of Warren, NJ, announced that the in-home care provider wants to make area veterans aware of specialized services to veterans. The Aid & Attendance benefit is an assistance program available to veterans through the VHA standard medical benefits package. Howe and her staff of caregivers at Comfort Keepers hope to work closely with veterans and help all who are eligible obtain these resources. "We want the best care available for our family members," said Howe. "And for the brave men and women veterans, these benefits are extremely helpful." Comfort Keepers of Warren, NJ, is embarking on this awareness campaign to get the word out and let all area veterans know that affordable in-home care is something their benefits package may be providing them. Applying and getting approved for the Aid & Attendance benefits can be challenging for some. Comfort Keepers of Warren NJ "believes it is always best to seek professional help to speed up the application process and offer you accurate direction," advises Howe. "Professional help is free, and there are plenty of resources available to you." Those available resources include elder law attorneys, the Local VFW, and the Local American Legions. If you think you are eligible for the benefits but don't know where to begin, Howe suggests call Comfort Keepers at (732) 369-3639 and they will lead you in the right direction. "This is an awareness campaign that we feel is going to have an enormous and positive impact on our senior community," said Howe. WiseGuyReports.com adds “Blood Bags Market 2017 Global Analysis, Growth, Trends and Opportunities Research Report Forecasting to 2025” reports to its database. This report provides in depth study of “Blood Bags market” using SWOT analysis i.e. Strength, Weakness, Opportunities and Threat to the organization. The Blood Bags Market report also provides an in-depth survey of key players in the market which is based on the various objectives of an organization such as profiling, the product outline, the quantity of production, required raw material, and the financial health of the organization. Blood Bags refers to Disposable Blood Bag. It is used for the collection, storage, processing, transport, separation and transfusion of Blood Banks and Hospitals, including FFP Blood Bags.There are such types for single blood bag, double blood bag, triple blood bag, quadruple blood bag, etc. The volume varies from 150 ml to 400 ml. WiseGuyReports.com adds “Adhesive Bandages Market 2017 Global Analysis, Growth, Trends and Opportunities Research Report Forecasting to 2025” reports to its database. This report provides in depth study of “Adhesive Bandages market” using SWOT analysis i.e. Strength, Weakness, Opportunities and Threat to the organization. The Adhesive Bandages Market report also provides an in-depth survey of key players in the market which is based on the various objectives of an organization such as profiling, the product outline, the quantity of production, required raw material, and the financial health of the organization. WiseGuyReports.com adds “Collagenase Market 2017 Global Analysis, Growth, Trends and Opportunities Research Report Forecasting to 2025” reports to its database. This report provides in depth study of “Collagenase market” using SWOT analysis i.e. Strength, Weakness, Opportunities and Threat to the organization. The Collagenase Market report also provides an in-depth survey of key players in the market which is based on the various objectives of an organization such as profiling, the product outline, the quantity of production, required raw material, and the financial health of the organization. Collagenase, obtained from Clostridium histolyticum, is an enzyme used for tissue dissociation in vitro and thus for isolation of many different types of cells. These isolated cells are then used for numerous clinical and research applications. MINNEAPOLIS, MN, USA, March 28, 2018 /EINPresswire.com/ — East View Press, the publishing arm of East View Information Services, is pleased to announce the publication of Russians on Trump: Press Coverage and Commentary. 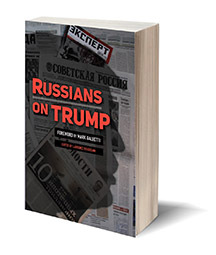 The book is an anthology of carefully selected articles from the Russian press related to the Trump phenomenon, all meticulously translated into English. Donald Trump was a well-known figure in Russia long before he ascended to the presidency of the United States, primarily for his attempts to build luxury properties in Russia, and his work in facilitating the 2013 Miss Universe Pageant in Moscow. After his surprise election win, his involvement in such projects took on a new importance, particularly the relationships Trump forged during this time. But with all the talk about Trump and Russia, one crucial element has been ignored or minimized: what do the Russians actually make of the 45th President? Given the allegations of a Russian conspiracy to put him in the White House the question is more relevant now than ever. Russians on Trump provides valuable insight into this question, offering readers a selection of pertinent articles and political analysis that have appeared in the Russian press over the last two decades. These articles deal directly with Donald Trump both as a savvy businessman and a political novice who has changed the American and global political landscape. The book explores the personal image that Trump projects in Russia, the inferences that Russian commentators make from his statements, and the unforeseen reverberations of his policies. Russians on Trump fills an important gap in the conversation about Trump by bringing together a treasure trove of Russian analysis never before available to the Western reader in a language other than Russian. Fascinating, enlightening and entertaining, this collection will interest both serious scholars and anyone with an interest in digging deeper into the Trump presidency. Visit www.eastview.com/russians_on_trump for more information or to order a copy. Global Electronic Toll Collection Market is accounted for $4.75 billion in 2015 and is expected to reach $10.96 billion by 2022 growing at a CAGR of 12.6% during the forecast period”. Factors such as increasing demand for safe and secure infrastructure, low travel time, cashless travel facility and free flow of traffic are propelling the market growth. High installation costs and high dependence on government are some of the factors limiting the market growth. Increased safety and better environment are providing ample of opportunities for the market growth. North America holds the largest market share during the forecast period followed by Europe. Asia Pacific is expected to have steady growth, whereas RoW represents a high CAGR due to increasing adoption rate of electronic toll collection in regions such as Africa, Middle East and Latin America. Some of the key players in Electronic Toll Collection market include Thales Group, Q-Free, 3M, International Road Dynamics, Inc., Siemens AG, Cubic Transportation Systems, Inc. Atlantia S.p.A., Schneider Electric SE, Transcore Holdings, Inc., Efkon AG, TRMI Systems Integration, Kapsch Trafficcom AG, Xerox Corporation, Honeywell International, Inc., Transurban, Transtoll Pty Ltd., Toll Collect GmbH, Sensor Dynamics and SAIC. 11.4 International Road Dynamics, Inc.
11.6 Cubic Transportation Systems, Inc.